4. mess free recipe, so that I should still be tidy after making this to hit the Friday Family Dinner. After browsing several awesome recipes and gazing at mouth watering dishes, I was set with these quick Nutella Cookies! This recipe met all my conditions and happened in jiffy with only 3 ingredients, I hit the dinner date with family too after baking these cookies! 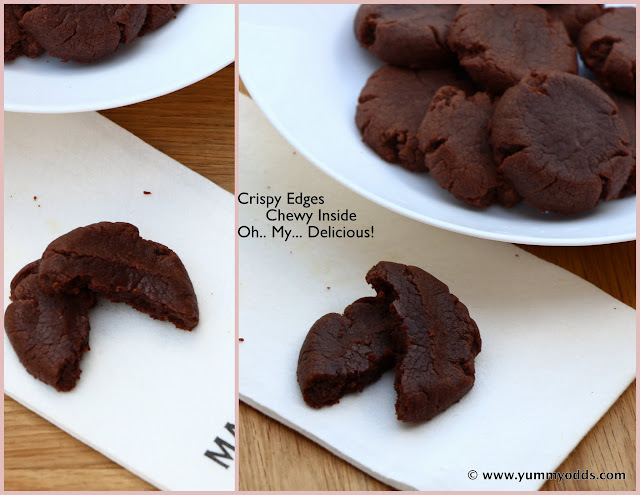 Usually I am not a cookie person, but Let me tell you all about these cookies, these are slightly crispy outside, very soft inside, chewy overall and melts in mouth, tasted awesome.. Oh boy these are so good and I am sure this recipe is a keeper and happens a lot in my kitchen! Take Nutella in a medium mixing bowl. Add egg and beat with electric mixer on medium speed for 2 min. Add flour to the same bowl and mix again for 1 to 2 min until everything is combined. Keep the mixer away, using your hands knead the mixture slightly until it gets dough consistency. Make a big dough ball or log and keep it aside. Pre-Heat the Oven to 350 F / 180 c degrees. Take the baking tray and place the silicon baking cookie sheets. Take 1 Tbsp of dough into hands and roll into small balls between your palms. Turn the dough into balls and place them on the baking sheet. 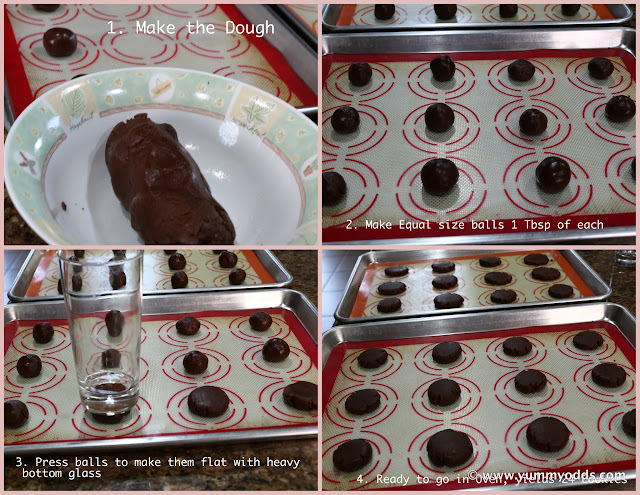 Take a heavy bottom glass, and press the balls gently so they become flat into cookie shape. Place the baking sheet in the oven and bake for 7 minutes. Take the baking sheet out of the oven and let the cookies completely cool for 5 min. Enjoy these cookies right away or store them in air tight container for later. This recipe yields 24 cookies of medium size. Silicon baking cookie sheets are so convenient to place the cookies in pre-defined circles. These cookies store good for 3 to 5 days at room temperature and 7 to 10 days in refrigerator. Oh.. My... these are so delicious! Happy Baking until next time!